Whether you are a major league baseball fan or a little leaguer's mom searching for the perfect baseball celebration cupcakes, you will love these baseball cupcake selections! Normally, I only feature one "fun food" per article, but I honestly could not choose a favorite myself. Therefore, today I am sharing 3 choices and you decide which baseball cupcakes are the biggest hit and knock it out of the ballpark for you. 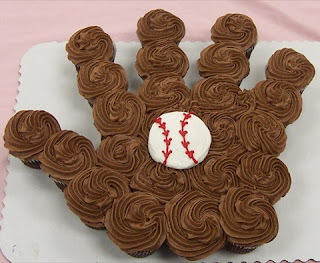 On Worth Pinning, Carrie gives us some great tips, tricks and instructions on decorating these really fantastic baseball cupcakes. She gives the instructions for creating 3 different designs: the baseball, the baseball and mitt, and the ball and bat design. There is definitely something here for everyone! I was most impressed with her easy instructions for creating the baseball mitt. It is a lot easier than it looks, but it will require a wee bit of patience. Because Carrie includes pictures, decorating these cupcakes would be pretty easy for anyone who is comfortable with the basics in cake or cupcake decorating. 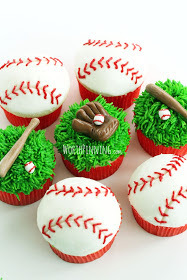 These baseball cupcakes would actually be a great beginner decorator cupcake project! A dozen or more cupcakes certainly allow for a lot of practice time. These baseball cupcakes require no instructions because the designs are actually created by the placement, or arrangement, of the iced cupcakes. Even though there are no instructions, the images are linked to their site of origin. It may not be easy to choose a favorite. I know I couldn't! You will probably want to choose one for this weeks celebration and bookmark this article so you can come back for the next celebration selection. I am sure you will want to serve them all before the baseball season is over. Children love specialty cakes and cupcakes. Moms enjoy creating party treats their children will be proud to say, "my mom made that!". I think any of these baseball cupcakes will be a home run with the entire team. 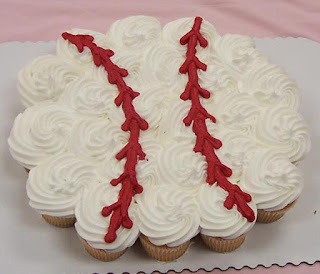 LOVE these clever baseball cupcakes. What a fun idea for us baseball fans! And thanks so much for including links to some of my baseball articles! I sure do like that chocolate glove with the baseball in the middle! Pinned for sure! !